Beyond the Book Reviews: First "Blogger of the Month"
Hello everyone! So to end the month of March I have decided to share a fun little thing I want to continue doing from this moment on. I would like to present a new feature that I will be doing every month. and it will consist of a post that includes an interview with the chosen blogger, along with featuring them in my sidebar for that entire month. I hope you guys are excited, because I am very excited to be sharing this. I have already done some interviews with some bloggers and it has been a lot of fun getting to see their responses and learning new things about them. 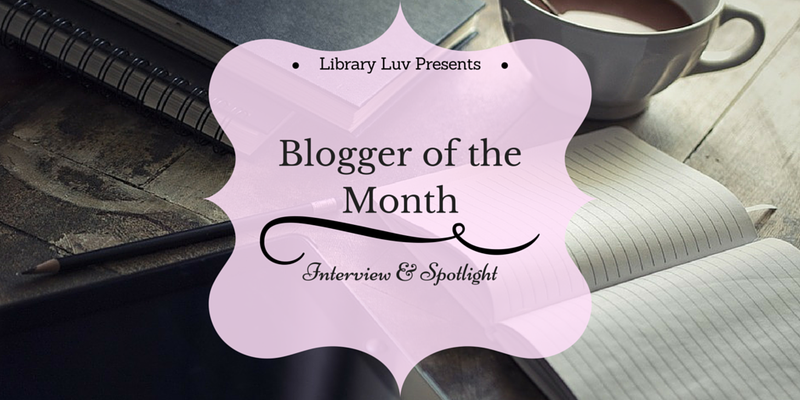 Nori Horvitz is a book blogger over at ReadWriteLove28, beta reader, and aspiring author. She has been blogging since 2015 and is the creater/host of the popular twitter chat #RQWN. She is also the organizer of Bookitcon, a charity book event that took place in 2015. She is currently organizing Bookitcon: Chapter Two which will be taking place on August 7, 2016! Sabrina: **Stands up to shake hands** Greetings Nori! It is a great pleasure to have you as my first blogger of the month. Sabrina: Why don’t we start off this interview with you telling us a little bit about yourself?--Such as your likes and interests. Nori: Ack you’re already stumping me! This is always the hardest question for me to answer. Hmmm well as you know, I love dogs, especially my poodle, Ellie Mae. My favorite color is purple. When I’m not reading a book, I’m generally playing with my dog, surfing the internet, or doing miscellaneous blog tasks! Sabrina: Since this is an interview focused on your blogging career, how did you decide that you wanted to take up blogging? Nori: It’s a funny story actually. I had wanted to start blogging a while before I actually started, but it was originally going to be a lifestyle blog, where reviewing books was just one part of the blog. But, when I was hand sketching my ideas, I realized that there was a heavy focus on books throughout the layout, and then I decided...why not just make it a book blog? Sabrina: Where did the idea of your twitter chat RQWN come from and how long ago did it start? Sabrina: How do you come up with all the questions for RQWN? Nori: I started blogging in July of 2015. I guess I would say that I officially entered the bookish community a couple of months later, when I started interacting with other bloggers on Twitter. Sabrina: What’s a book that you recently read that you would recommend? Nori: SO MANY! But, the most recent 5 star read would have to be...THE SERPENT KING BY JEFF ZENTNER! My review will be live on my blog soon! Sabrina: What books are you eagerly awaiting to release this year? Sabrina: Thank you so much Nori for being my first blogger of the month. It has been so much fun interviewing you, and thank you for being such a big part of the book blogging community. I can’t wait for all the future RQWN. Nori: Thank YOU Sabrina! This was so much fun! That concludes my first "Blogger of the Month". I must thank Nori again for agreeing to partake and basically be my first Guinea pig. This was so much fun, and I can't wait to interview more bloggers in the future to come. This is such a cool idea! Great interview so much fun!